We all want people to watch our stories, right? When our team launches a new film I’m sure I’m not the only one who logs into our Vimeo account a little too much to see if people are watching it. But hitting the play button is only half the journey we wish for our audience. We also want them to stick with our story and watch it all the way through. After all, we can spend MONTHS working on just one piece, and it can be rather heartbreaking if it’s turned off after a few a few frames. If they get bored and don’t make it all the way through. So when we get people to click play, when they start watching our video, there is one single ingredient that, without it, your story is going nowhere. Without it, you’ll lose them. Without this one thing, your story goes nowhere. Let’s explore what that ingredient is—and why it is so powerful. And how it it works to hold your audience until the very last frame. More than that, we’ll offer proof too. We’re going to show you a feature we did for Super Bowl Sunday on CBS. Something we knew would get millions of views just because of where it was being shown and so we wanted it to be perfect. More than that, we’re going to show you an earlier edit, side-by-side, so you can see for yourself the crucial role this ingredient plays. Let me start with a story. A true story. Bear with me, the next few sentences will be tough to get through, but I promise it will be worth it if you stick it out. So let me tell you about my lunch the other day. Right next to our studio is Sizzle Pie, an awesome pizza place. The other day I walked down there and grabbed a slice and a salad. While they were heating up the slice, I headed down to the washroom. I came back, grabbed my food, and started to eat. It was delicious. As I finished up I grabbed my dishes and placed them in a bin (in Portland you bus your own tables). I then headed back to the studio, a short block away, to get back at it. Bored…? No conflict equals no engagement. There is a powerful insight into our natural reaction when we hear a story with no conflict—we wonder where it’s going. In this case you’re probably wondering, Why are you telling me this? So let’s try that again, a story of lunch, but this time some conflict. Right next to our studio is Sizzle Pie, an awesome pizza place. I walked down there and grabbed a slice and a salad. While the lady was heating up the slice, I headed down to the washroom. As I came back, she called out ‘number 93’ and threw a slice and salad on the counter that looked like mine. I didn’t have my receipt, so I didn’t have my order number. But it WAS what I ordered, so I grabbed the food and headed a couple seats down. Like 15 seconds later a dude walks up and starts asking where his food is. I slowly slide over so I’m out of sight. The hostess walks up to him, also confused, and says she just put it down there. The guy starts getting upset–he’d been waiting a while–and the girl clearly can’t help because she is sure she put his food out not more than a minute ago. And I’m hiding in the corner just hoping they don’t look over and think I stole it. See how much conflict adds? And this isn’t even a BIG conflict, it’s just a small mix-up over a lunch order. But it immediately makes it WAY more interesting. Oh, and I did confess by the way. Plot is the vehicle to bring your viewer through your story. Conflict is the fuel. Without it, your story goes nowhere. But wait, we have proof. Paul Zak, a leading neuroscientist on story (and a guy I am so pumped to be doing some Muse work with in the near future) did a study on HOW conflict works to make for great storytelling. He invited people to his lab, hooked them up to a bunch of sensors, and had them watch some videos. What he found was that when watching a story, conflict causes our brain to release the stress hormone cortisol. And that causes us to pay attention, to focus. As a storyteller, that’s critical, right? We live in a world of shortening attention spans, of being so incredibly busy and so much happening, we need people to not just hit play but to pay attention, to focus—and that is what conflict offers us. Here’s a super simple scenario that really brings the power of conflict home. Imagine you’re in the movie theatre thoroughly enjoying the latest Hunger Games. And then, all of a sudden, smoke starts pouring in from underneath the emergency exit. The room is rapidly filling up with smoke. Stop for a second. Imagine you’re in that theatre. Imagine that you’re in that seat watching the screen as you see the smoke pour in. What’s the next thing you do? Well, you look around to see what everybody else is doing. You sit up and pay attention to the smoke. You might yell, you may run out, but either way your world became all about that smoke and everything else disappears. Voilà, we run into conflict and our attention is grabbed, and our focus, aimed. And that’s what happens inside your viewers when a character they care about runs into conflict. When our character runs into conflict, she then sets out on a journey. When she sets out on this journey, we, as storytellers, are also presenting viewers with a QUESTION. If they care about our character (which is a whole other topic to dive into) then they’ll want to know the answer to that question. They’ll want to know if she can overcome. They’ll want to see if she can do it. And when we, as the audience, have a question that we care about—one we don’t know the answer to—it’s a natural part of our behavior to be driven to find the answer. And we do that by sticking with the story till the end. Questions are born out of conflict. And conflict leads to journey. Without the conflict, there is no challenge. There is nothing to overcome. How do you feel about somebody who achieves something amazing and didn’t have to work for it? We don’t feel all that good about them. We often devalue his accomplishment. After all, we’re working hard for our dreams so it doesn’t feel right or fair if somebody else just falls into his success. So conflict presents a challenge—something for our character to overcome. And that journey to overcome is what allows for growth, for change. When we see the character work to overcome the conflict we become more invested and we feel the answer to our question that much more. At the simplest level, the surest way to keep your viewer engaged in your story is to create a question. Create a question that the viewer wants to see answered. And conflict does that so very well. Bringing conflict in early in your story, and having a question born out of that conflict—together, these pave the way for a journey. It paves the way for a strong story that will hold your viewers until the last frame. Plot is the vehicle to carry the viewer through your story. Conflict is the fuel. Without it, your story goes nowhere. And out of conflict a question is born. As is a journey to overcome. And for our viewers, they’re focused, attentive, and they have a burning question with only one way to get the answer—watch our story. Of course, there is more to it. There are actually 6 Essential Plot Points in your story’s structure and we’ve touched on one of them heavily and two of them lightly here. To keep viewers really engaged throughout our story, we need to master all 6 of these Essential Plot Points. 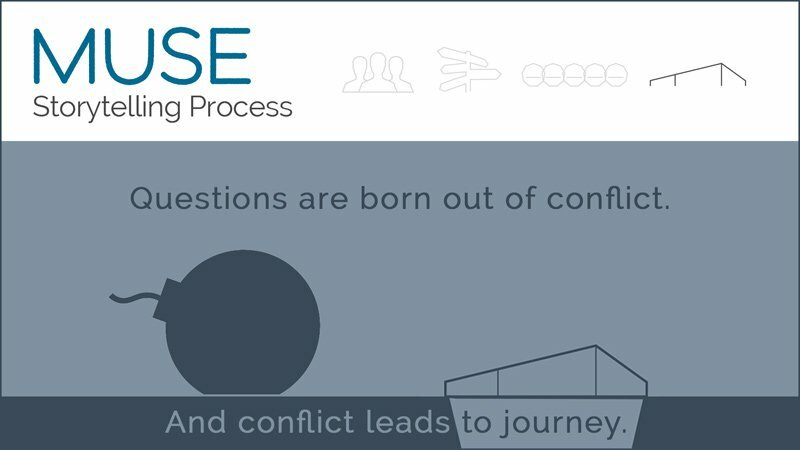 Just head on over to Learnstory.org and check out the Muse Storytelling Process for a deep dive into the 4 Pillars of story; People, Places, Purpose, and Plot. A reliable and repeatable process for crafting films that move your audience and keep them engaged from the first to the last frame. This is a very powerful post. Thanks, Patrick, for sharing the two versions of Aunt Jane’s story. That one change made the film much more engaging. Something to remember for commercials as well as films. Something to remember in any story—even those we casually tell when hanging out with friends.If we’re sitting there and wondering ‘where is he going with this?’ that often comes because the story simply meanders without a direction, and no clear point. It lacks conflict. How does one download the Conflict Tutorial and worksheets? Hi Philip, just click the image that says “Sign Up for Free Muse Training” and “Get Access Now”—that will take you to a page to put in your email address. Then we’ll send you a link. Enjoy. Beautiful! So loving and generous to those of us who love stories and crave to tell our own. Thank you. Thanks so much for saying so Nicholas. We spend days putting these together so that they can be well researched, fun to read, yet valuable for you. So always amazing to hear you’re enjoying what we’re sharing. Another engaging story about story 🙂 Thanks Patrick. Your tips and tricks here are awesome!! Really helpful to filmmaker wannabes. 🙂 For those out there, you can also checkout this helpful link http://goo.gl/Fvu8OL for your films. Cheers! Absolutely your presentation was fantastic.Many of important things you show up ours easily.i hope you will be better more and more opportunities for ourselves.